Silver Demon won by Ravenswood with Magma Cannon! 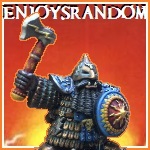 CDO Forums / Chaos Dwarfs Online / Website News / Silver Demon won by Ravenswood with Magma Cannon! Author MessageSilver Demon won by Ravenswood with Magma Cannon! Ravenswood Has Won A Silver Demon! Hip hip hooray for Ravenswood! Many of us have followed his brilliant painting progress through the realm of Hashut over the years, and now he is reaping renown in the Golden Demon painting competition. Behold the silver winning entry, an exquisite Magma Cannon! Find out more here about this miniature paintjob which earned him silver. This post was last modified: 10-04-2018 06:46 AM by Admiral. Very nice, I'm sure most of your work would be eligible for a top 3 spot in any golden demon comp! very nice mate. Check out my Google Drive, and my Ebay Store, message me if you have any questions. The Silver Demon is well deserved! Wonderful work, congrats Ravenswood!! Always nice to see Chaos Dwarfs getting a little bit of the spotlight! You represent us all well. Serious Kudos here. Very impressed.